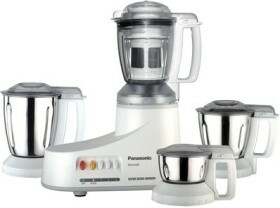 A vital kitchen appliance, this Panasonic Mixer Grinder can be used for juicing, blending, whipping, and grinding. This mixer grinder comes with flow breaker jars for efficient functioning, and magic seal protection for lubricating the motor and preventing entry of water into it. It is easy to use with its piano type plastic buttons and 3 speed and pulse settings. The Samurai edge blades provides tough performance and durability. The plastic blender jar comes with a capacity of 0.65L with juice filter and 1L without juice filter. The stainless blender jar has a capacity of 1L while the chutney jar has a capacity of 0.2L. The stainless mill jar has a capacity of 0.5L dry and 0.3L wet. For efficient performance, the mixer grinder comes with a powerful 550W motor. For your safety, this Panasonic appliance is equipped with a safety lid locking system and a unique interlocking safety system to ensure that the lids and jars are locked in properly. Unbreakable Polycarbonate Juicer Jar, Safety Lid Locking System, Unique Interlocking Safety System, Magic Seal Protection, Flow Breaker Jars, Ratings Voltage: 220 - 240 V, Piano Switch Style, Plastic Switch Material, Speed Settings (0, 1, 2, 3) Pulse, 0.65 L with Juice.